With only 23 shopping days left until Christmas Day, the time is now for you to get your last-minute campaigns — like contests and special offers — in front of your customers. Whether you’re just getting started with your holiday promotions or you’ve been advertising over the last month, get inspired by these online marketing ideas to reach your customers over the next few weeks. 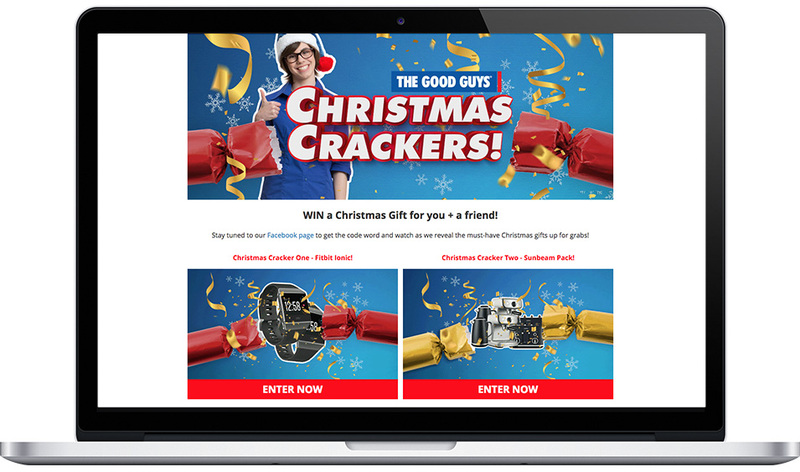 The following campaigns encourage creative approaches to online holiday marketing, including a weekly giveaway, a win-your-wish-list promotion, and a downloadable gift guide. Plus, try a hashtag contest if you want to drum up some user-generated content and increase customer engagement on Twitter and Instagram. Daily and weekly surprise giveaways are very popular during the holiday season. They are perfect for encouraging repeat engagement with your customers. I love the creative approach The Good Guys took with their Christmas Crackers campaign. Each week, a new Christmas cracker opens to reveal an awesome prize. To set up the campaign, The Good Guys team created images with links to four separate campaigns that are set to open weekly during a four-week span. Want to know the best part? Winners receive two prizes — one to give and one to keep. TIP: Use our time-based visibility settings to start and stop showing Widgets at specific times. This allows you to automate the content on your campaign, so you can have everything ready to go in advance. Want to create a campaign with a daily prize? Check out our Multi-Day Giveaway Calendar Template! With this template, days are unlocked one-by-one to reveal a new prize and entry for each day. Wishlists are a great way to make holiday shopping easier for our friends and families. Grainfather created a perfect example of a win your wishlist campaign. With this promotion, folks can choose the Grainfather products they would love to have. Learn more links that link to the item on the Grainfather website are included with each product to help familiarize folks with the products, and even give them the chance to purchase the product right away. Entrants are encouraged to share their wishlists after submitting their entries. Although folks can only win three items from their wishlist, they can choose more than three. This is perfect, because even if someone wins, there are likely still items remaining on their wishlist for loved ones to purchase. 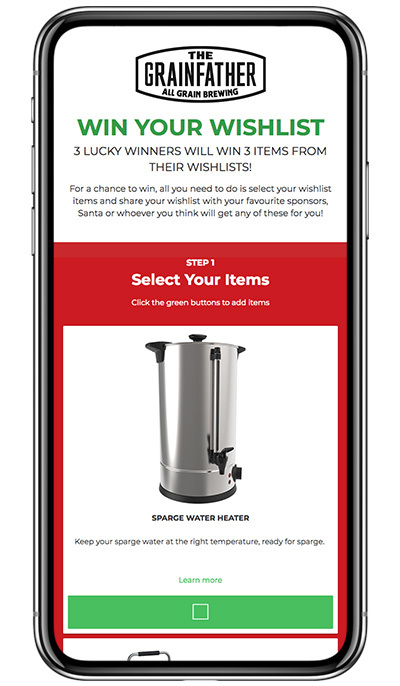 TIP: Use our Marketing Automation feature to send entrants their wishlists via email. This gives them yet another opportunity to send this information on to friends and family who might not be as active on social media. Gift guides are a helpful tool for both gift givers and gift getters. Why? Most people have no idea what they want for gifts. Take a peek at Kolya Naturals’ campaign to see how it’s done. 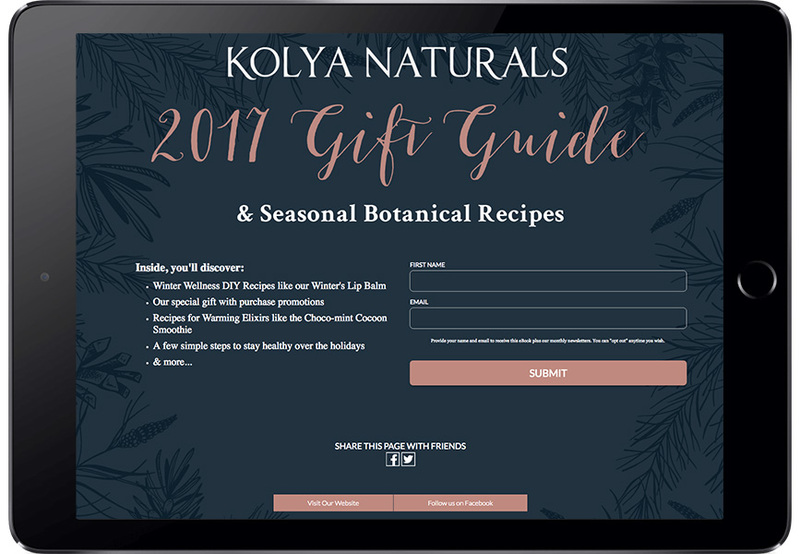 Kolya Naturals asks folks to submit their email address and name to receive their gift guide ebook that includes gift ideas, DIY wellness recipes, tips for staying healthy during the holidays and more. Sending the ebook via email is a smart idea, as it both grows Kolya Naturals’ email marketing list and it ensures people are submitting their “best” email address because they want to receive the guide. Plus, it gives people the chance to download the gift guide on both their mobile device and their personal computer. TIP: Use our Marketing Automation autoresponder emails to send folks a downloadable PDF of your gift guide after they submit their email information. Then, follow up a week or two later with a scheduled email with links to some “hot” gifts on your website. Not interested in collecting entries via a form? Try a hashtag contest instead! Hashtag contents are ideal for increasing engagement on Instagram and Twitter. They require people to think about your brand, especially if you ask entrants to post a photo or video to enter. Plus, they promote brand awareness, as entrants must post to their own profiles in order to enter your contest. From memories in the kitchen to decadent delights, show us your favorite holiday traditions for a chance to win $200 in Shutterfly credit, plus up to a year’s worth of @Pillsbury product and prizes.😋 Use #ShutterflyChefSweepstakes and make sure your profile is public. Ends Dec 22. Successful entries will receive an auto response from Shutterfly. Take this example from Shutterfly and Pillsbury. Folks are asked to post photos of their favorite holiday memories on Instagram with the hashtag #ShutterflyChefSweepstakes in order to enter the contest. Along with the necessary hashtag and entry guidelines, the contest prize and rules to enter are clearly stated in the Shutterfly post. I like that Shutterfly and Pillsbury are partnering up on this contest, as cross-promotion can help both brands reach new people in their target market.